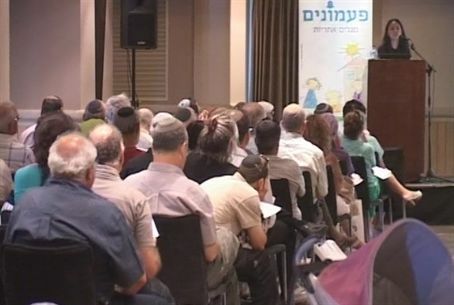 The Paamonim organization held a special day of educational sessions for its volunteers from throughout the country. The volunteers heard lectures on a wide variety of topics, all related to the how a family can reach stability in all fields of life. Arutz Sheva TV attended the event and spoke with Naomi Sharon, coordinator of educational programs for the organization. The Paamonim organization strives to bring about a situation in which families conduct their economic activities with balance, responsibility and integrity. The goal is to promote national economic and social strength. Paamonim is a social non-profit organization operating throughout Israel. Paamonim seeks cooperation with other bodies in the third sector including voluntary institutions and other non-profit organizations, as well as with bodies in the public and business sectors, in order to pursue its goal of achieving economic balance for families.